A collection of 29 perfectly crafted sonnets exploring everything from hilarious convenience store encounters, a Wordsworth parody, and thoughts on teaching, to sober reflections on the thin grasp we have on sanity and life itself: “Great blue herons sometimes make me cry / For all the grace lost through mere possession.” This collection of 29 sonnets is from a much larger work-in-progress accepted for publication at a future date. 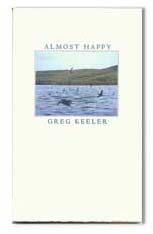 Greg Keeler has taught English literature and Creative Writing at Montana State University since 1975. A prolific painter and musician, he’s written several musicals and published eight books of poetry, including American Falls (Confluence Press, 1987), and Epiphany at Goofy’s Gas (Clark City Press, 1991). He’s recorded a dozen CDs and tapes of his satiric and flat-out funny collections of songs and poems, including Live from Nowhere (Troutball Productions). Winner of a number of awards for teaching and writing, he was awarded the Governor’s Award for Outstanding Achievement in the Humanities from the Montana Committee for the Humanities in 2001. To learn more about Greg, visit his website: http://www.troutball.com/. Letterpress printed in a limited edition of 350 copies on Mohawk Superfine paper and sewn by hand between Rising Stonehenge wrappers, featuring a cover painting by the author. $15 (plus $3 Media Mail shipping).